Abruzzo is one of the twenty regions of Italy, in Southern Italy on the Adriatic Sea. The capital is the city of L'Aquila. The region is located in Southern Italy bordered by Marche to the north, Lazio to the west, Molise to the south and the Adriatic Sea to the east. Aterno-Pescara, 152 km (94.4 mi) long. Sangro, 122 km (75.8 mi) long. Vomano, 76 km (47.2 mi) long. Tordino, 59 km (36.7 mi) long. Liri, 120 km (74.6 mi) long, 40 km (24.9 mi) in Abruzzo. The Tronto river is 115 km (71.5 mi) long but flows mainly in the Marche region. The highest mountain in the region is Corno Grande (42°28′10″N 13°33′56″E﻿ / ﻿42.46944°N 13.56556°E﻿ / 42.46944; 13.56556﻿ (Corno Grande)), in the Teramo province, with an altitude of 2,912 m (9,554 ft). San Pietro a Coppito church, L'Aquila. ↑ "Eurostat – Tables, Graphs and Maps Interface (TGM) table". European Commission. 12 August 2011. Retrieved 15 September 2011. ↑ "EUROPA Press Releases – Regional GDP per inhabitant in 2008 GDP per inhabitant ranged from 28% of the EU27 average in Severozapaden in Bulgaria to 343% in Inner London". Europa (web portal). Archived from the original on 12 February 2012. Retrieved 8 October 2013. ↑ "Abruzzo" (in Italian). Tuttitalia.it. Retrieved 2 October 2017. ↑ "Corno Grande, Italy". Peakbagger.com. Retrieved 2 October 2017. ↑ 5.0 5.1 "Statistiche demografiche ISTAT" (in Italian). Demo.istat.it. Retrieved 2 October 2017. 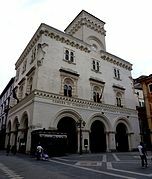 ↑ "Comuni abruzzesi per popolazione" (in Italian). Tuttitalia.it. Retrieved 2 October 2017. This page was last changed on 6 February 2019, at 19:41.